We have numerous opportunities on this trip to visit important heritage and conservation sites, in the company of fully trained local guides and conservationists who help to educate guests on the best and most responsible way to travel. The Pantanal, for example, is South America's primary wildlife sanctuary, while the Amazon is famed for its biodiversity. In both these areas we use local guides from the area to discover the surrounding nature and landscapes. The guides are so important to our tours as they can help us understand the struggles that these areas go through to maintain their natural habitats. Unfortunately given the distances travelled on this trip, we do have a carbon footprint through flight emissions. 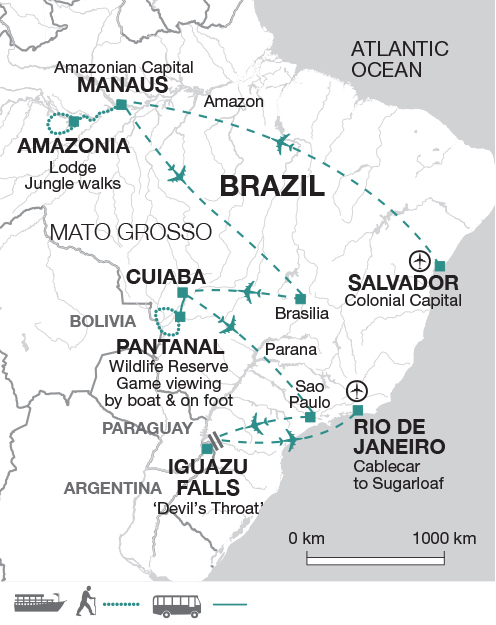 This means that when we land in our destinations, we try and travel as environmentally aware as possible – for example in places like Iguazu, the Amazon and the Pantanal, our excursions will take place on foot and by boat, which not only allows us to travel more sensitively but also gets us further off the beaten track and closer to nature. Using internal flights is a necessity to get around Brazil, but to further mitigate this, our Tour Leaders will encourage customers to put money into the local economies that we’re visiting through frequenting small, locally run restaurants and other businesses. On this trip guests stay in locally owned and run lodges and local guides are hired throughout. This helps to support local people and ensure they have a stake in maintaining this sensitive environment for future generations. We currently work alongside Cool Earth to offset our carbon emissions across the business, on projects that support indigenous communities in the Amazon rainforest through community engagement, education and empowerment. We fund emergency evacuations for 16 different villages, as well as their schools and family cooperatives. To date we have protected over 800 acres of rainforest by working with local communities through Cool Earth. In addition to the above, we are continually looking for ways to improve and are proud to be ‘Responsible in everything we do’. Education is key and so all staff, Tour leaders and partnering suppliers are trained in responsible and sustainable tourism. At our Head Office, we continually strive towards a sustainable and planet-friendly working environment, including having solar panels installed and a company commitment to reducing our plastic usage. As well as this, we have valuable and longstanding partnerships with UK charities Toilet Twinning and Send a Cow, plus many smaller initiatives and projects around the world. We’re members of UK travel industry bodies Tourism Concern and AITO because we believe it’s important to share our knowledge and experience, as well as learn from other operators.